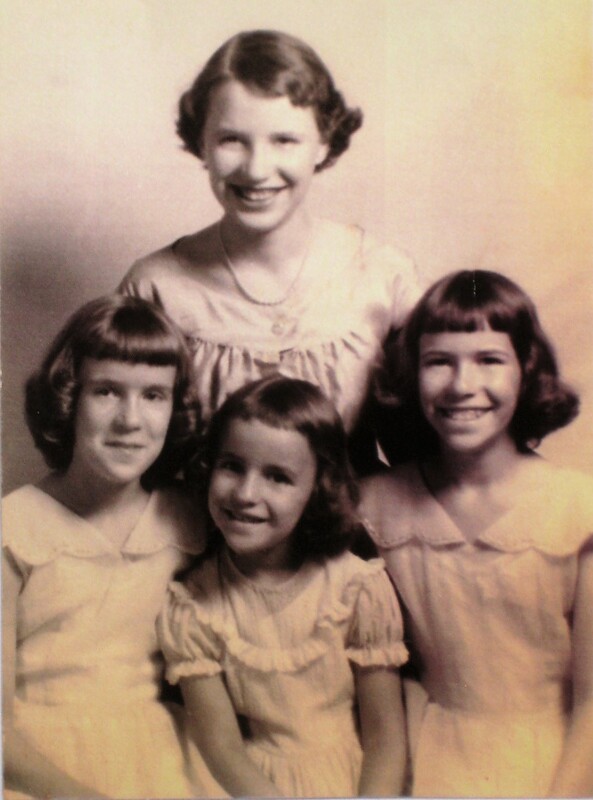 The McGee Girls was the first group of which I became a member, complete with official status as the oldest. Our group as daughters of a country preacher always gave me an affinity to the Bronte sisters as the vicar’s daughters. The first photo in this blog shows us in the only professional photograph made while we were growing up for which Ruth gave her bangs a haircut. Likenesses and differences have followed us into adulthood with all of us winding up in some branch of the teaching profession. I taught kindergarten, second grade, and junior high language arts. Beth became a librarian and Gwyn a high school math teacher. Ruth worked first with children who had speech problems and went on to become an advocate for students with learning challenges, looking for the most efficient and effective ways for the students, parents, and teachers to enhance learning. All four of us added another last name, moving the one we share to the middle. Our differences reflect our personalities as our likenesses reflect our core. Occasions to get together in adulthood come all too seldom with two of us on either end of Mississippi, one in Virginia, and one in Georgia. This Thanksgiving gave us much to be thankful for as we gathered in Gwyn’s well-designed home with beautiful table settings that she dreamed of as a girl. Seventeen additions were present with the original four – husbands, children, and grandchildren – quite a bit of thanksgiving even without the twelve children and grandchildren who couldn’t come. The second photograph shows us today still having a bit of fun for the camera though nobody cut their own hair for the picture. Rising to the top in my gratitude list this year was the continued status of being one of the McGee Girls and even my permanent standing as the oldest. While we are different in many ways like the “come on in and sit a spell” feel at my house rather than the elegance of Gwyn’s, we share values that make life good – faith, family, fun, and food.